With Sara Kalies being the first to register, Luray admin Laura caught up with her to ask her about her strategy. Laura: You were the very first person to register for the Luray Triathlon. You registered 1 minute quicker than the 2nd person that registered. Hopefully you are as fast on race day as you were on registration day. How do you feel about that? Sara: Wow, what a unique honor to be first. 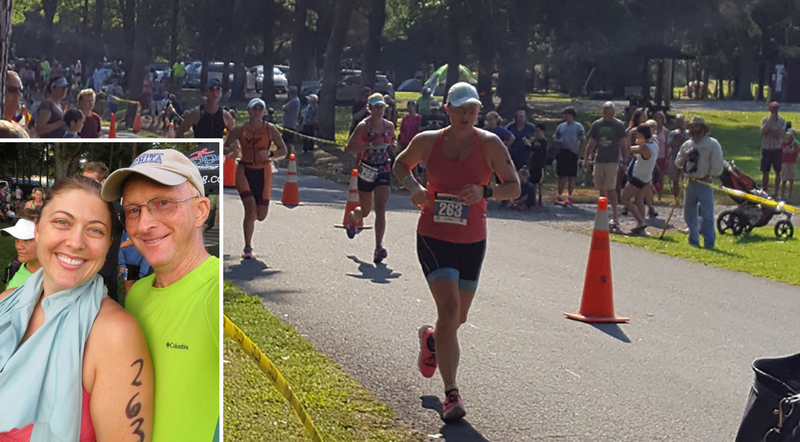 I assure you, for race day I am simply an age-grouper and don’t ever aspire to win an overall place: but am happy to continue challenging myself “tri”ing. Laura: What was your strategy to come in first in completing your registration? Sara: I actually had the day off and set an alarm at 7:50am so I could get one of those discounted registrations right at 8:00am. Laura: What was your motivation to complete your registration before everyone else? Sara: I’m a sucker for a good deal. Laura: Well congratulations on your registration into the Luray Triathlon! Have you competed in the Luray Triathlon in the past? Laura: Can you tell me about your past experiences? Sara: My first experience at Luray was humbling. I’d never swam in open water without a wetsuit. I had never swam with SO MANY others swimming alongside me. I was several months out from my 2nd left knee surgery and couldn’t run. But my friend encouraged me to aquabike it – and it was great! I live west of Roanoke but grew up on a family dairy farm in Wisconsin. That first Luray, my dad had recently sold his cows and flew down to the bustling Luray County Airport. Growing up on the farm, when I was in high school and college, my dad was never able to get away from milking the cows to attend any of my cross country or track meets or regattas (I, by the grace of God, passed a swim test in college to be on the crew team), so it was really special having him there cheering for me – and for him to finally be able to watch me compete at something! And, of course, it was earth shattering to both of us that I survived the swim. All those YMCA swim lessons as a kid and at the age of 32 I finally learned how to exhale through my nose while underwater and actually freestyle. Better late than never, though. We almost didn’t make it last year – but after a great race weekend (and surviving all that eclipse traffic), we decided I would definitely race in 2018 and make our father/daughter race weekend an annual tradition. One in which the Wisconsin family heirloom cowbell makes quite a glorious racket! Laura: Do you have any goals for 2018? Sara: My goal is to keep racing injury-free. Generally it means more time on the bike and slower runs. I find inspiration watching those men and women who are in their 6th and 7th decades still racing! That is my goal. I want to feel that alive when I’m 70 and people my age barely walk to the mailbox for exercise. It would also be great to never need another knee surgery again! Laura: What else does 2018 have in store for you? Sara: I also hope to compete at the Monticelloman in May. Outside of my triathlon training, I enjoy section backpacking the Appalachian Trail and home improvement projects with my fiance. Laura: Thank you for answering my questions and we wish you a good training season and to have a great race day at the Luray Triathlon in 2018. Sara: Thank you. I love your race and look forward to August.